Have a grocery store or other retail establishment? 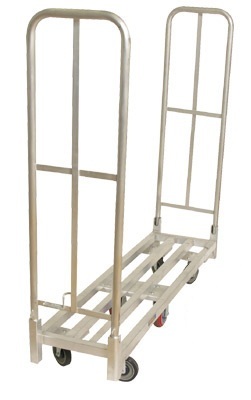 Stock up on our U-Boat Carts! Also make sure to check out all of our utility carts. Call us for best available pricing and special volume discounts. If you’re looking for a uboat cart, stock truck, or something of that sort, maybe for retail stores, supermarkets, or warehouses, then you need to examine the full line-up of stellar products that are out there now. You’re not bound and limited by your local supply store anymore. The Internet has opened up opportunities like never before to choose from models and features that you want, versus being limited to just what is offered at your local supply store. What’s more, is that you can choose your prices. You can pick and choose from the models that you can afford, instead of being forced to go with whatever the salesman is trying to push on you. That’s the beauty of the Internet. That’s also the beauty of specialized stores that offer the most important products all in one easy-to-use grid layout. Let’s take a look at one of the uboat trucks that’s offered for sale, a real top-seller online right now, and you’ll see how easy it is to get a concise overview of a great product, without all the hassle and huffing and puffing of dealing with a salesman back and forth, like at the supply store, when you’re already tired at the end of the day from running your business. So, the model being reviewed here is he Galvanized Steel U-Boat Platform Truck with Treadplate Deck. 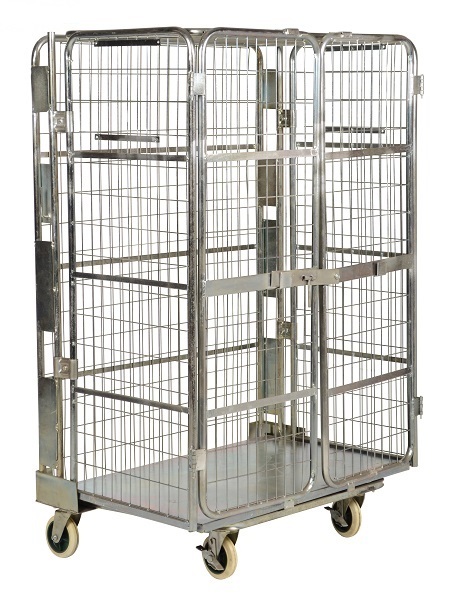 It’s made out of galvanized steel, and it can hold up to a 1750 lb capacity, and it has removable handles that will let you move heavy loads and control how you transport things too. It has a tread plate deck that gives it extra stability as well. It also has a couple of center polyurethane casters that give it a lot more stability. The deck dimensions are about 60” by 18”, and it has a deck height of 10.75 inches. It gives you really easy maneuverability in slender aisles and tight spaces. Let’s take a look at another model. The aluminum U-Boat truck is one more quality aluminum model. It’s a U-Boat stock cart, but it only has a 1322 lb capacity, compared to the higher capacity of the other model. Plus, it has removable handles, and you’re able to control how you store and transport heavy loads. Plus, it has two rigid center casters and four swivel end casters that let the trucks turn on their own radius. It offers easy maneuverability in tight aisles and confined spaces. The different weight capacities of the models should show you how much variation there is between stock cards and stock trucks. You need to make wise purchasing decisions with your inventory manager, instead of making the wrong kinds of purchasing decisions with one of your employees who doesn’t know the lay of the land, so to speak, in the warehouse. 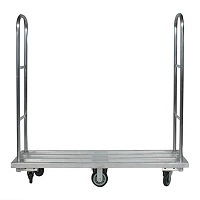 An office manager or owner is the best person to purchase these kinds of carts for the warehouse floor or retail store. They are going to know the weights of things that need to be transported, and they are going to know the right weight capacities of the trucks for transporting the stuff. It’s not smart to choose stock trucks and stock carts haphazardly, or based on the reviews of other customers on third-party review and shopping sites. It’s a good idea to go through an evaluation of everything you’re going to need, and choose in a good way that’s based on the company’s needs. You could be wasting a lot of money on these relatively expensive pieces of equipment if you don’t get together the right people when you’re making the purchasing decisions. Let’s take a look at another new model, just for good measure. 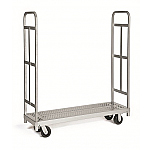 The Welded HD Steel 2 Shelf Stock Cart is a pretty big one, and it’s perfect for narrow spots. It has a capacity of 800 pounds. These stock carts and stock trucks are some powerful devices for warehouses, retail stores, and shops. They’re really awesome to help you move cargo around, and they can save your workers a lot of backache from hauling. They’re an excellent investment in the safety of your workers, and they help get things done and move more efficiently around your place of business too. You don’t want business to move more slowly because it takes so long to haul stuff around. That’s why it’s important to get these kinds of stock trucks quickly, before people in your place of business get injured or have trouble at work because you haven’t purchased these items. 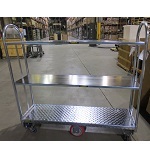 Stocking Carts are a must for anyone with a retail store or warehouse. Give yourself and your workers a break and come have a look at our complete line of uboat platform carts. You will save time and money by shopping at Handtrucks2go.com!